The Landscape Institute collections are exciting and visual, as can be seen through the wealth of images we have used in this ‘Discovering the Landscape’ series of blog posts. 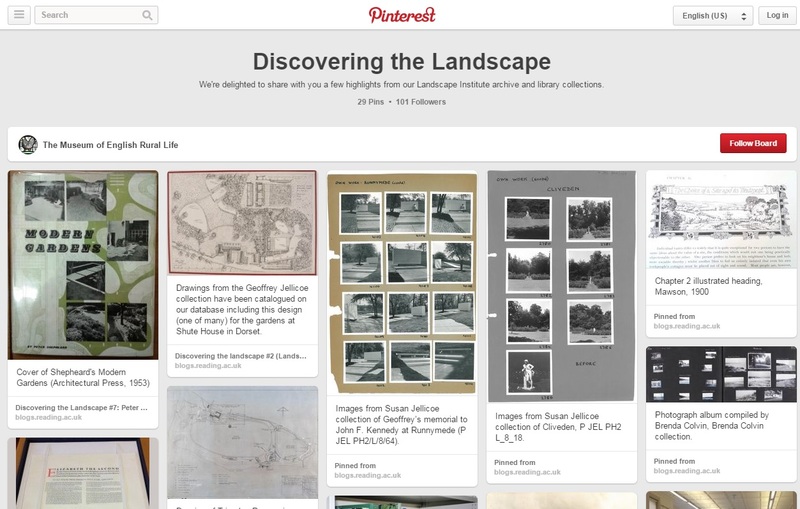 Now we have created a new Pinterest board dedicated to the Landscape Institute on MERL’s Pinterest site. Pinterest is a great way of grouping together images from webpages on a virtual pinboard. A screenshot of the new Landscape Institute board can be seen above. It is essentially a more visually pleasing way of bookmarking interesting content that you find online, as is discussed by my colleague Adam here. I will continue to add to the board as sorting and cataloguing of the collections continues. As ever please do contact us on merl@reading.ac.uk if you have any questions. This entry was posted in Discovering the landscape. Bookmark the permalink.